Fed by snowmelt from the Warner Mountains, the Pit River creates a 7,000 acre oasis for wildlife in the high desert of northeastern California — Modoc National Wildlife Refuge. The 7,021-acre Modoc Refuge is located along the South Fork of the Pit River in Modoc County, southeast of the town of Alturas, in extreme northeastern California. The Refuge is located on the western edge of the Great Basin, a high elevation, cold desert environment. The Refuge consists of wetland, reservoir, riparian, sagebrush-steppe, and cropland habitats. The rugged Warner Mountains rise dramatically above remote ponds, wet meadows, and sage uplands along the Pit River. Redheads, gadwalls, hundreds of tundra swans, and other waterfowl gather on extensive marshes, shorebirds fan out around ponds. Dense wetland vegetation hides secretive nesting species, including black-crowned night herons and Virginia and sora rails. Sandhill cranes nest on the refuge and can be seen feeding their young. Summer broods of Canada geese, cinnamon teal, and others are mixed amoung American white pelicans, great egrets, and white-faced ibises. Resident mule deer gather near headquarters and along the 2-mile auto tour that encircles Teal Pond. Black-tailed jackrabbits, cottontails, and muskrats are common, as are migratory songbirds. More than 240 bird species, 82 nest here. There is a high probability of seeing waterfowl, shorebirds, and songbirds in spring and fall, including cranes. 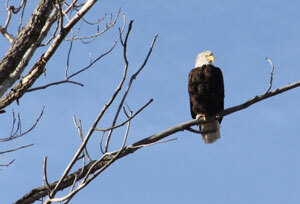 Good viewing of bald eagles in winter. Excellent birding near headquarters, on auto tour. South of Alturas, look for cranes on east side of Highway 395, pronghorn on west side in spring. View the wide open spaces and experience the beauty of the backdrop of the majestic Warner Mountains. 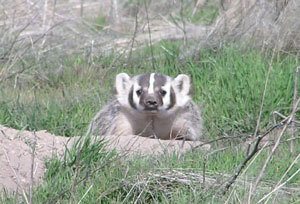 Wildlife is abundant throughout the year, with a variety of species.